BOSS Hugo Boss dress pants in washed linen. Slim, tapered legs. Unfinished hem. Side slash pockets; back button welt pockets. 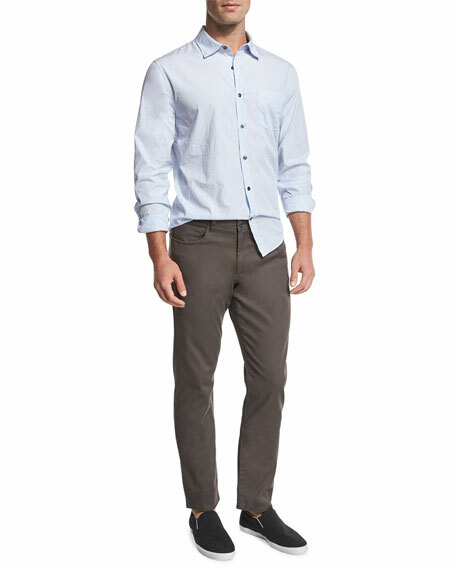 BOSS Hugo Boss dress pants in washed linen. Slim, tapered legs. Unfinished hem. Side slash pockets; back button welt pockets. Button/zip fly; belt loops. Linen. Made in Turkey. Model's measurements: Height, 6'0"/183cm, Suit 38, Shirt 16 x 34, Waist 32"/81cm, Inseam 32"/81cm. Canali pants in stretch cotton/silk blend. Quarter top pockets; back button-welt pockets. Flat front. Straight leg tapers to ankle. Cotton/silk/spandex. Canali pants in stretch cotton/silk blend. Quarter top pockets; back button-welt pockets. Flat front. Straight leg tapers to ankle. Cotton/silk/spandex. Made in Italy. 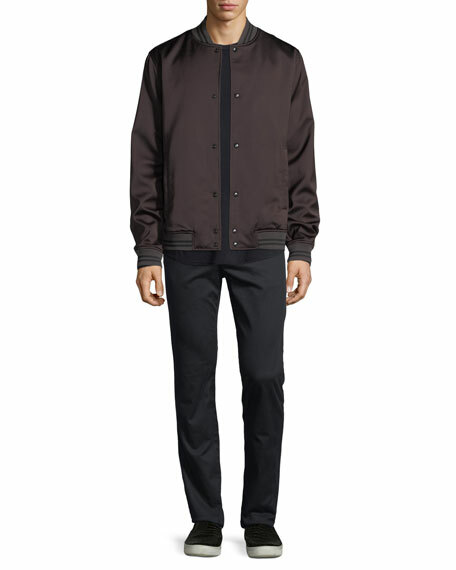 Model's measurements: Height, 6'1"/185cm, Suit 40L, Shirt 15 x 35, Waist 32"/81cm, Inseam 34"/86cm. Marcelo Burlon "County" multicolor logo pants. Side slip pockets; single welt back pocket. Relaxed fit through tapered leg. Logo on left thigh. Cotton. Made in Portugal.